Okay, I realize this post may seem a bit out of the ordinary, yet if you've visited with me for very long you know how much I enjoy finding inexpensive little pleasures. So I thought I would share. Have you ever bought these delightful bottles of linen water at the dollar store? They are wonderful for spritzing on your clothes when you iron. But being the non-ironing gal that I am, I've found another use for them. I love to spray them on my sheets and pillows right before I go to bed at night. The scent is very delicate yet it still freshens the bed and the room. Aaahhhh, talk about feeling just a bit pampered, smelling a little L'essence de Provence just as you drift off into dreamland! I love these, and have picked some up my self. I love good smelling scents to have through out my home. I use it on my bed when I remake it. Love that it makes my room feel prettier. I love that kind of stuff and the best part is you only paid a dollar! Anything to help your home smell pretty is good thing!! I love them and have bought several different scents at the dollar store. My favorite is the lilac! I adore anything lavender. It is such a relaxing fragrance. Have a great Thursday. I love linen water...my husbands family all use it when they iron! I do a linen spay on my sheets at our cottage-it feels and smells so good to fall into a fragrant bed. 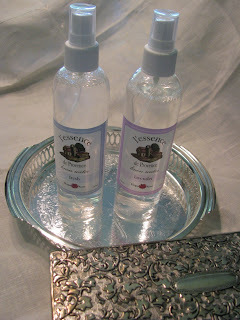 Love linen water...great out about the sheets...I may try that tonight! First time visitor to your blog. I spray my pillowcase and sheets with a lavender spray and I'm soon off to dreamland! Mmmmm sounds lovely! I may need to try some to help me sleep. Thank you and have a peaceful weekend! I have some of these, but unfortunately I didn't pay a dollar. Glad to know where to find these for much less! THANKS! I bought some of these and went crazy. The smell reminded me of a bed and breakfast we stayed at, so to see if my hubby would notice, I sprayed it in the closet, the shower curtain, the rugs, the dog (no, I didn't but I might) and our bedsheets. Never thought about doing this before....I have sprayed perfume on my sheets though :) I need to check that out at the Dollar Store! I didn't have any linen spray, but I found a bottle of Rosemary Body Wash that I was gifted with some time ago and rarely use. So I decided to see what it would do when I washed my sheets. MMMMMMMM, it smelled really good! It was so nice to lay down on clean, fresh, scented sheets last night! I slept like a baby. You just gave me an idea! I've been making my own laundry detergent and using vinegar as fabric softener. The clothes are wonderfully clean but I miss the fabric softener scent. I think I will pick up some linen water to spritz as I hang the clothes. Thanks!